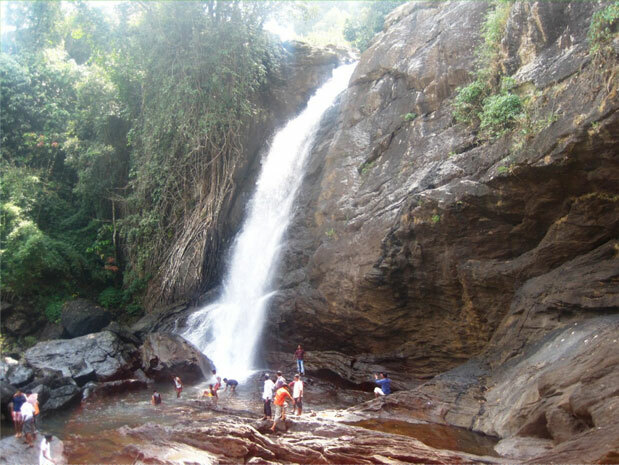 Soochipara waterfall which is also called as Sentinel waterfalls is situated in Wayanad. The water falls from a height of 100 to 300 ft and is 3 tiered. It is one of the biggest waterfalls in our state. In the three tiers of the waterfall, the first one which is the longest is the one which could be reached easily. It is a risky task to reach the second waterfall and only adventurous travelers take the risk to reach to the third waterfall. These three falls lie in meenmutty, soochippara and kanthanpara. Finally they combine and then fall into the Chaliyar River. There is a pool below the falls where the tourists can take a dip. Tree houses are constructed here and the visitors can stay here if needed. The cliff called as Sentinel rock is ideal for rock climbing which has a height of about 200 m. This waterfall situated in Vellarimala is surrounded by dense forests. On the way to this falls one can enjoy the beauty of the tea estates in Wayanad. The view of the valleys, hills and the shining waters are all breathtaking. Large number of tourists visits this place especially during the weekends. Basic facility such as even a toilet is not built here. Plans are put up to set up toilets and ticket counter here. An interesting feature here is the rock caves and is loved by the tourists who wish to have adventure during their travel.